In different countries, propolis has been used as food supplement, which provides organic balance of immune system and as alternative treatment for some diseases1,2. Studies have shown that due to the presence of flavonoids in its chemical composition2, propolis has anti-inflammatory immunomodulator, antiproliferative, antibacterial, antiviral and antioxidant properties2,3. Candidiasis caused by species of Candida genus has high incidence due to the increasing number of immune suppressed people. It has being observed an enhancement of resistance of these fungi to the actual antifungals3. In this work ethanol extracts of green (GrProp) and red propolis (RdProp) were subjected to in vitro assays against six C. albicans ATCC strains and 10 clinical isolates. Minimum inhibitory concentration of extracts was determined. The extracts stood out in relation to the growth inhibition of all ATCC Candida tested, with concentrations varying from 125.0-1000.0μg/mL (25% RdProp) and 500-2000μg/mL (100% GrProp). In relation to inhibition of growth of all tested Candida spp.,best results were found for extract 25% RdProp (125-1000μg/mL) and 100% GrProp (500 -2000 µg/mL). Due to observed anti-Candida activity was inferred that RdProp have potential to be used against candidiasis. 1. Babaei, S, Rahimi, S, KarimiTorshizi, MA, Tahmasebi, G, KhaleghiMiran, SN (2016). Effects of propolis, royal jelly, honey and bee pollen on growth performance and immune system of Japanese quails.Veterinary Research Forum, 7(1), 13–20. 2. Daugsch A, Moraes CS, Fort P, Park YK (2008).Brazilian Red Propolis - Chemical Composition and Botanical Origin.Evid-BasedComplementAlternMed ECAM. 8;5(4):435–441. ISNAD FREITAS, M. D. , LOPES, G. A. , OLIVEIRA, N. A , ALMEIDA, B. M. , ABREU, S. R. L. , BASQUES, R. C. , BINDA, N. S. , FIGUEIREDO, S. M. . "In Vitro Evaluation of Green and Red Propolis Extracts Against Candida spp". 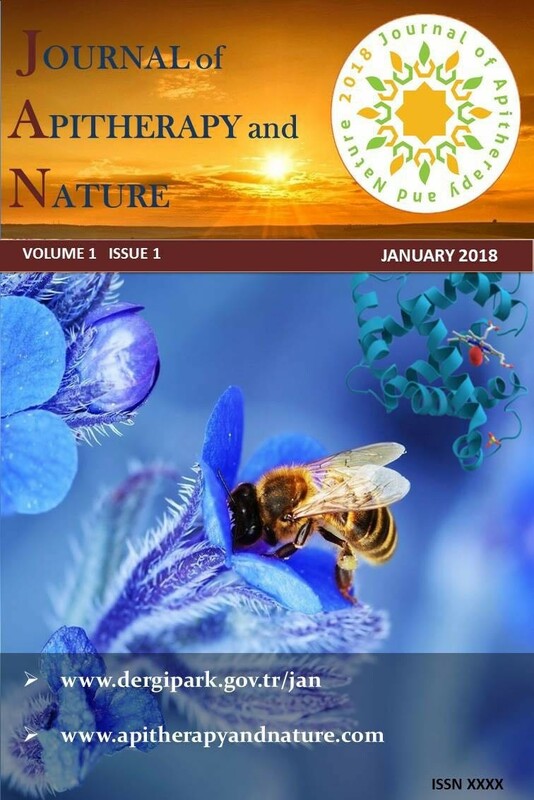 Journal of Apitherapy and Nature 1 / 3 (December 2018): 41-41.